You are here: Home / Money / Business / Seven financial tips a black woman should follow: How black women can get back on track financially. 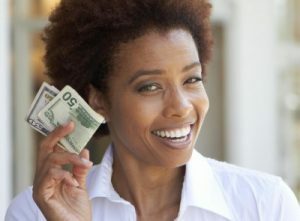 Seven financial tips a black woman should follow: How black women can get back on track financially. 1. Stop treating your boyfriends like husbands-The problem with black women is that we are treating our boyfriends like husbands when we are not married to them. This behavior is detrimental on so many levels and more so speaking at a financial aspect of co-signing loans for cars, bank accounts, and credit cards. A black woman is seemingly okay with entering long-term agreements with a man who has not made any attempt at making a commitment such as getting married. Most often a black woman is the one saddled with the debt of something she co-signed for after that man has moved on and is driving himself and another woman in the car that you are left paying for. If that man has no intentions of making you his wife you need to take yourself and your money and move on. 2. We don’t know how to say NO and mean it-This is something that many black women face is dealing with needy family members and friends. Black women are givers by nature in the blac k community and we will give to the point where we deprive ourselves of things. It starts with giving in church, then bills, and then those family members and friends who have no intentions of paying you back. We have this notion that we are “helping” those around us, but we’re actually not looking at the big picture that family and friends can often times take advantage of our kindness along with compromising our own financial lives. If you are a person who’s responsible and pays their bills on time the last thing you need is to be broke along with the very person(s) you’ve helped. Sometimes it does not hurt to say NO and family and friends will get mad, but clear boundaries makes a world of difference. 3. We make our appearance TOP priority-It’s a known fact that black women put their appearance first and foremost, but some of that flyness could actually be done on a reasonable budget. Is getting those fancy designs worth another $10 to every single mani/pedi that important? Think about what would have happened if we had less flashy hairstyles and manicures that were not super flashy we would be saving a few extra dollars between appointments. When you go and get your nails done only go for basic colors and most are ok with a French mani/pedi because it goes with anything and only requires a polish change every two weeks or if you have the acrylic or gel nails they can be redone once before you have to soak them off for them to be redone. Sometimes flashy is not always worth spending the extra money and some of us also work in a professional setting so it’s wise to get your nails done in one color so it looks professional and tasteful. 4. Stop eating out and going to the club-Right there should say it all why do some sistas don’t want to cook a meal at home they always have to eat out? They do it because their friends are doing it, but the question is are they working where they can afford to do that on a regular basis? If not then it’s time to rethink about the limitations of your finances are at and rethink about your priorities. If you eat out for a whole month that’s enough money to fund a savings account for at least a couple months. Sometimes eating at home is more cost effective than eating out daily and weekly. Add up the amount you spend on club cover charges and drinks and that’s enough to pay for a month’s worth of trips on public transportation for one month. 5. Stop supporting GROWN men-This is a big issue with black women they are always quick to shell out money to pay for things a man should be handling on his own. Your money should be spent taking care of YOU not an able bodied man to lay around your house, eating and drinking up everything. If a man requires a woman to take care of him send him home to his mama you are not here to financially support an able bodied man. Bottom line grown adults should be able to stand on their own and not depending on others to support them. 6. Stop helping out family and friends-Part of the reason black women are broke most of the time is because they’re busy helping out their family and friends. This is the very reason you’ll stay broke because you’re spending your money taking care of everyone else, but you and the moment you start doing for yourself people want to have something to say about it because you’re cutting off the gravy train. Sometimes you have to do that in order to let people know that you have to take care of your needs. Everyone needs help every now and then, but when you have family members and friends who come to you on a regular basis for financial help you have to know when to draw clear boundaries as to who you help out so you don’t feel used and mistreated. 7. Start and contribute to a savings account-Many times black women don’t save any kind of money for emergencies and unforseen circumstances. If you take a few dollars out of each check on a weekly basis you can have enough money to put aside for an emergency or unforseen situations such as a job loss. Too many black women are borrowing themselves into financial ruin because they don’t have any kind of savings put aside to cover themselves with. If you can afford between $5-20 out of every paycheck put that aside towards a savings account. When you invest in yourself you are helping yourself to do better financially. If more black women took the means to take back control over their financial lives they will see better results in getting their financial lives back on track. Drawing boundaries in terms of who you help and assist will stop a lot of family and friends from abusing and taking advantage of you. Black women go through enough drama when they have friends and family who are financially challenged and see them as a personal piggy bank. Setting boundaries and sticking to it will slow down or even stop people from getting comfortable asking you for money on a regular basis. This article has many good ideas. Ladies stop treating your man like an ATM. Pay your own bills and if you ruined your own credit, that’s on you. Use child support for the child, not to get your hair fixed, nails done or buy a bigger house and pretend its for the child’s benefit. Don’t be a golddigger and don’t expect from a man any more than you are willing to give. One last thing, “black” women, learn not to let material things define you or cover for your insecurities.